Heineken advertises its 0.0 alcohol-free malt beverage in a hilarious new commercial, released with the #NowYouCan hashtag. 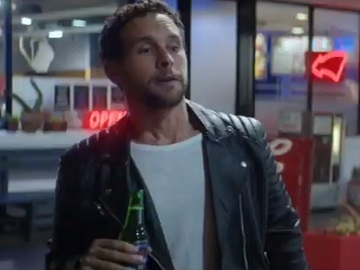 The 30-second spot, set in a gas station, opens with a young man drinking a beer as he returns to the car. One of his two friends jumps at the wheel and makes a hand sign, asking for the car keys. The guy with the beer in his hand, who it turns out is the car owner and the driver, refuses to give him the keys, showing him that the beer he’s having is with 0% alcohol. His friend keeps asking for the keys and the reason why is soon unveiled: a fourth guy trying to put gas doesn’t reach the fuel filler inlet and the car needs to be moved a little. The commercial, scored by Production Music’s “It’s Your Thing (The Isley Brothers Cover),” ends with the onscreen lines “Heineken 0.0 Great Taste Zero Alcohol” and “Now You Can Before Driving”. Heineken 0.0 was launched in May 2017, in Barcelona, Spain, and has since been introduced in more than 30 countries. The U.S. campaign for this beer debuted earlier this year, in January, with four humorous spots created by agency Publicis. The ads feature people drinking what appear to be regular beers in inappropriate situations and reveal, afterward, that the beverage is actually alcohol-free Heineken 0.0.